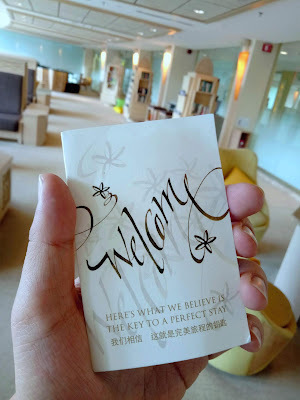 Special thanks to Golden Sands Resort by Shangri-La for extending this hotel review invitation. 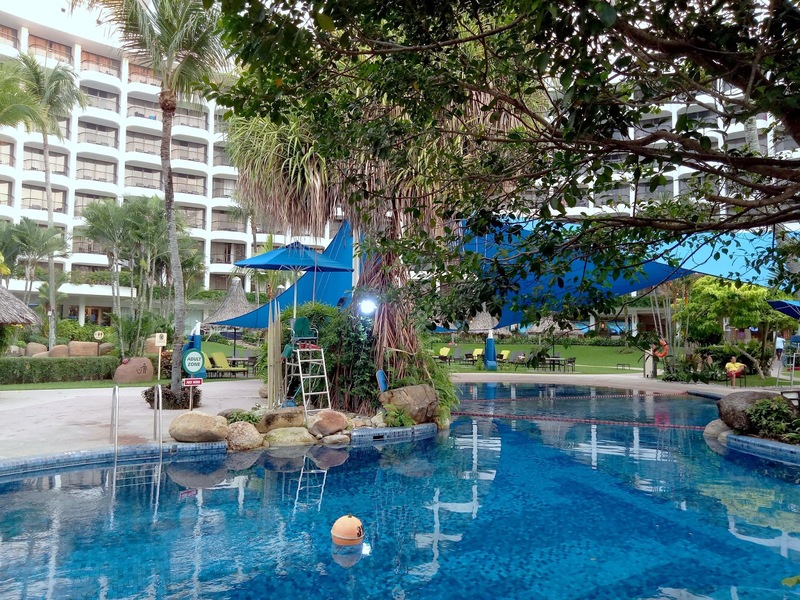 Golden Sands Resort by Shangri-La is a 4-star hotel at Batu Ferringhi. 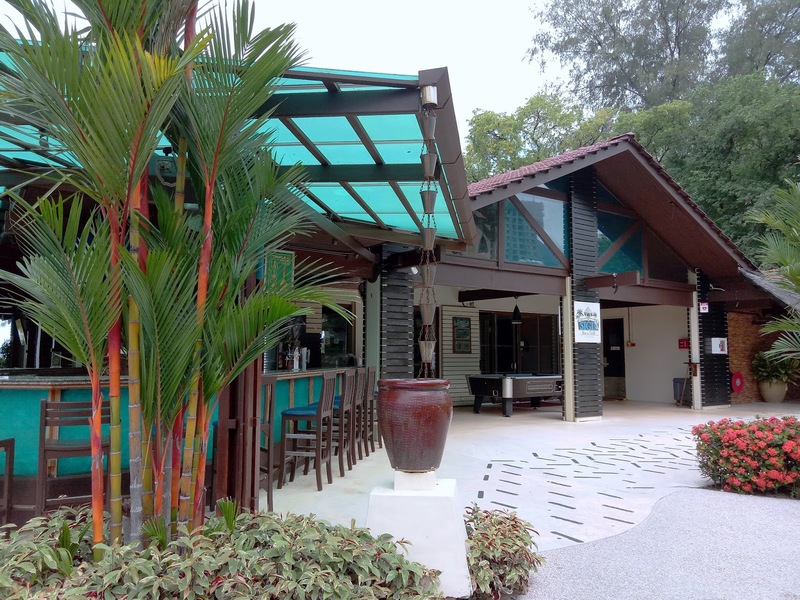 Operating under the Shangri-La's brand of hospitality, Golden Sands Resort is situated adjacent to Rasa Sayang Resort & Spa. It also shares many amenities with its sister property. 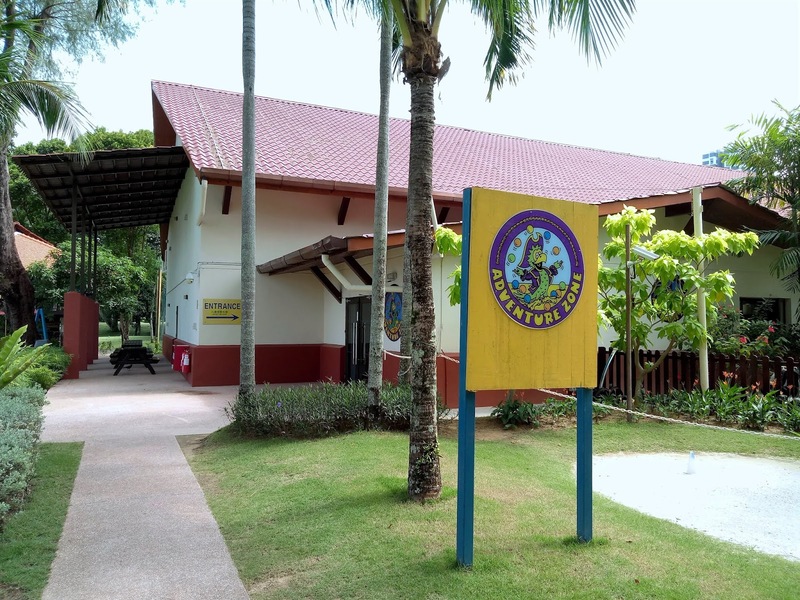 Compared to Rasa Sayang, Golden Sands Resort presents a more casual setting as it caters to families with children. 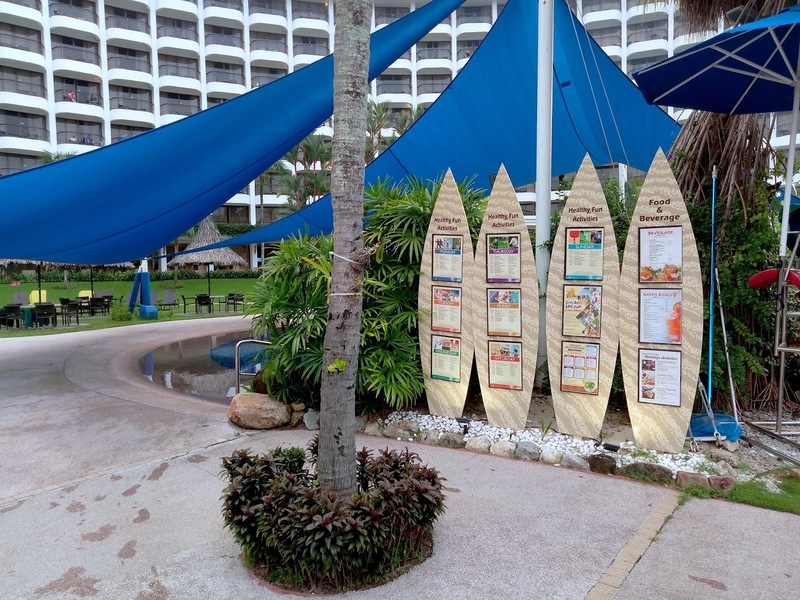 Golden Sands Resort has nearly 400 guestrooms and suites throughout 7 floors. 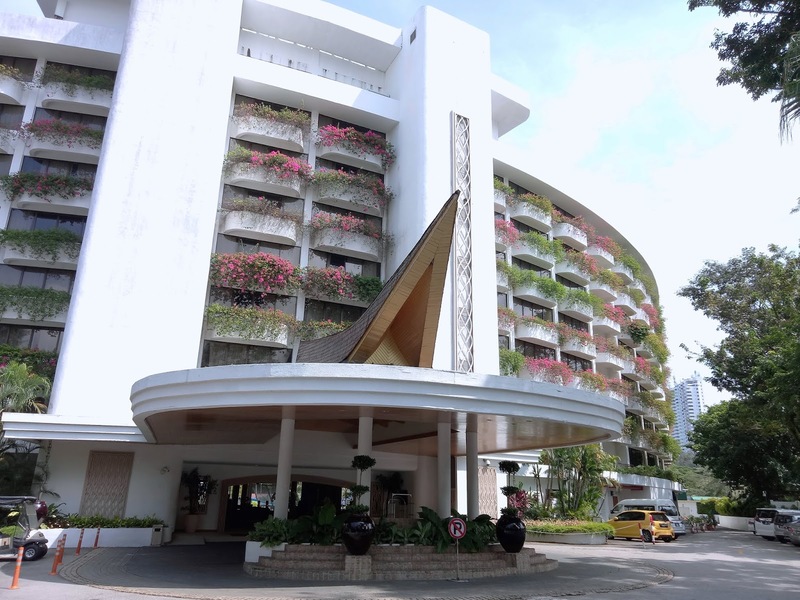 The main building curves around an expansive tropical garden that is extensively landscaped with lush greenery. Another advantage that the resort enjoys is the easy access to the famed Batu Ferringhi beach. 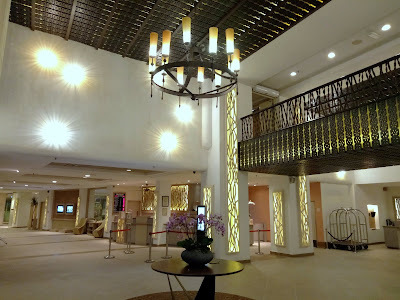 The main check-in counter is located at the hotel's main entrance. A refreshing glass of calamansi juice is served as the welcome drink. For quicker check in, Golden Circle members may approach the personalized counter at the Cool Lounge. This is also where early check-in and late check-out guests can relax in the comfort of air conditioning. There are shower facilities for guests to use while waiting. 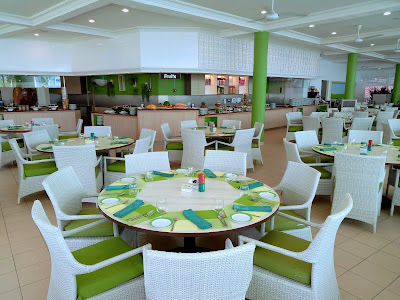 Golden Sands Resort has 4 room categories: Superior Room, Deluxe Room, Executive Seaview Room and Executive Suite. The one that I am staying this weekend is the Executive Seaview Room. 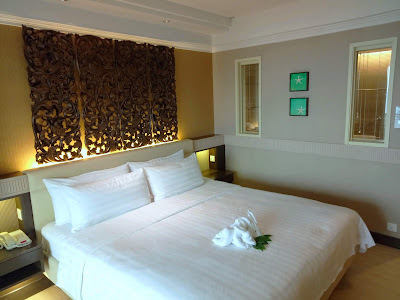 Furnished with a king-size bed, the room is reasonably spacious for 2 persons. 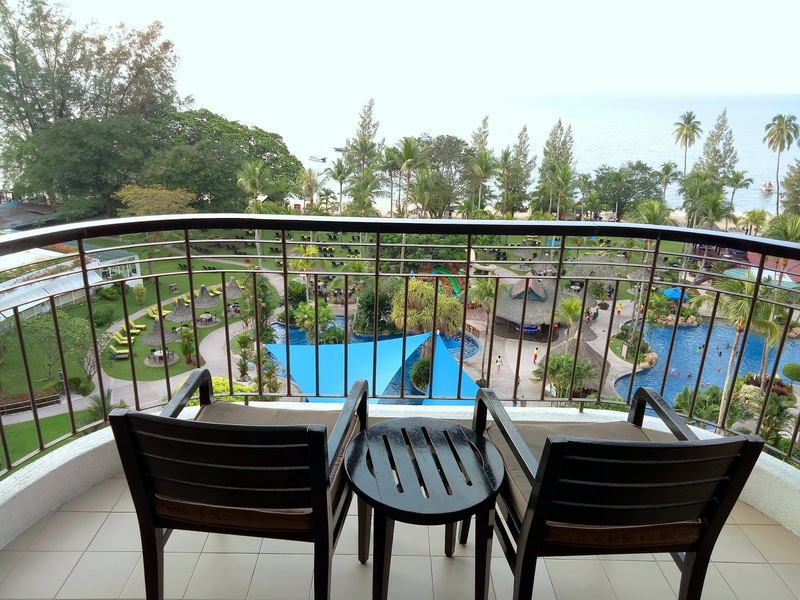 The Executive Seaview Room has a private balcony which faces the hotel's swimming pools. The view is particularly mesmerizing especially when the weather is good. A pair of beach chairs allows guests to sit back and enjoy the cool breeze from the sea. The ensuite bathroom has a marble countertop with double sinks, and a shower stall with heated water. Toiletries and clean towels are provided. 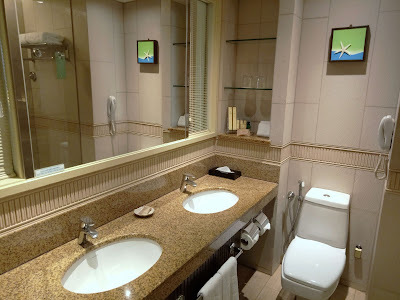 I am amused by the fact that the bathroom is specially designed to allow guests to watch television from within. A glass panel is strategically positioned to allow unobstructed view of the television screen. The bathroom is also equipped with piped-in sound system with adjustable volume control. For entertainment, the room is furnished with a flat panel television with premium channels. Next to the television is an office desk with complimentary stationery and high speed Internet access. Other room amenities include a wardrobe, clothes iron, safe, minibar, electric water boiler and hair dryer. It is interesting to note that the resort has an in-house water bottling facility. 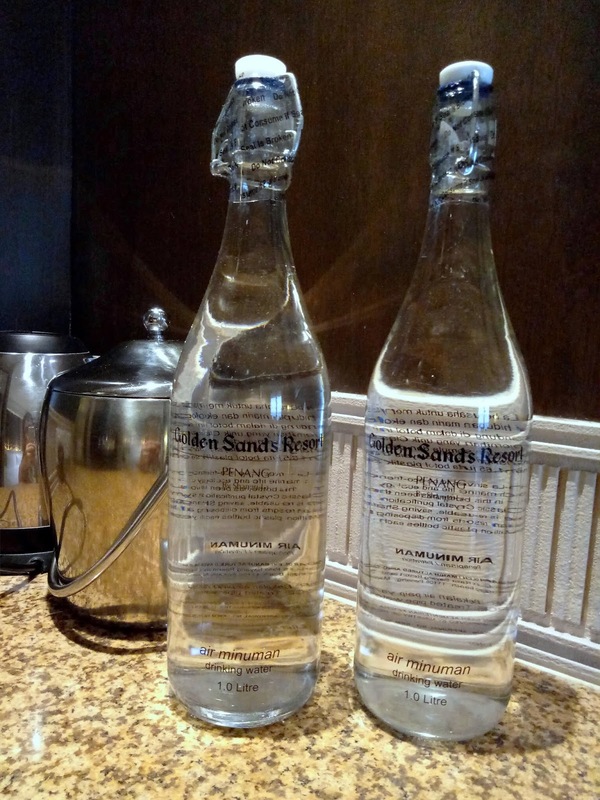 Glass bottles are used in order to minimize plastic waste. 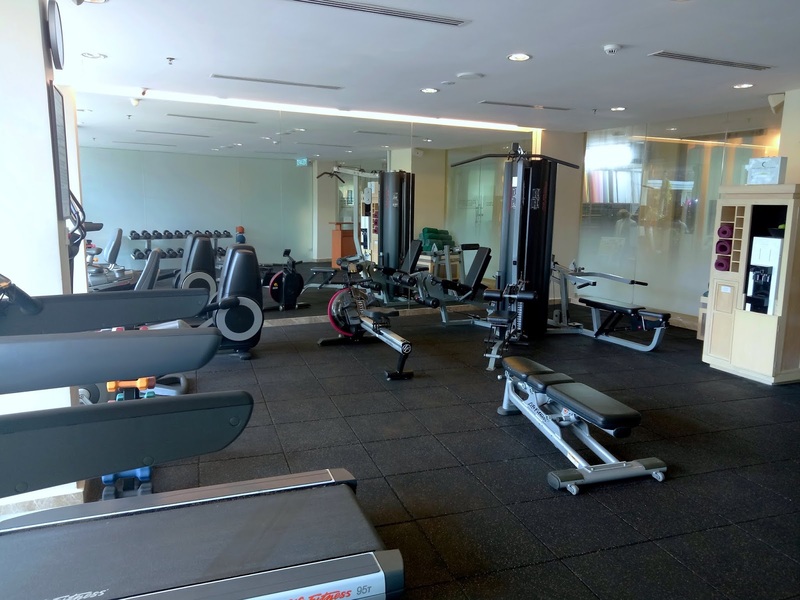 Regardless how long one's stay is, there is no shortage of recreational activities in the resort. 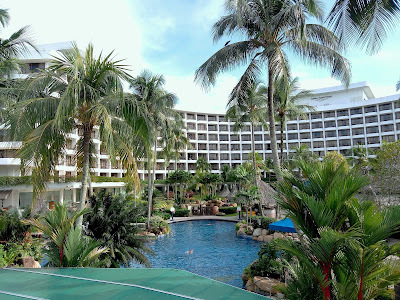 Between the hotel's main building and the beach are two lagoon-shaped swimming pools as well as several smaller ones. The space between and around them are dotted with coconut palm trees, cabanas and sunloungers. The swimming pools are remarkably clean and well maintained. 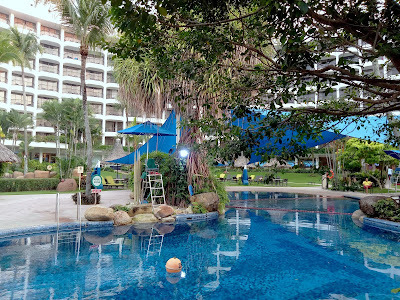 Acknowledging the fact that the afternoon sun can be too intense at times, one of the larger swimming pools is partially sheltered by shade sails. For safety reasons, children and adult sections of the swimming pools are clearly delineated. Lifeguards are posted during the pools' open hours from 7:00am to 8:00pm. As a family-friendly place, Golden Sands Resort prides itself on its fun-filled Splash Zone. 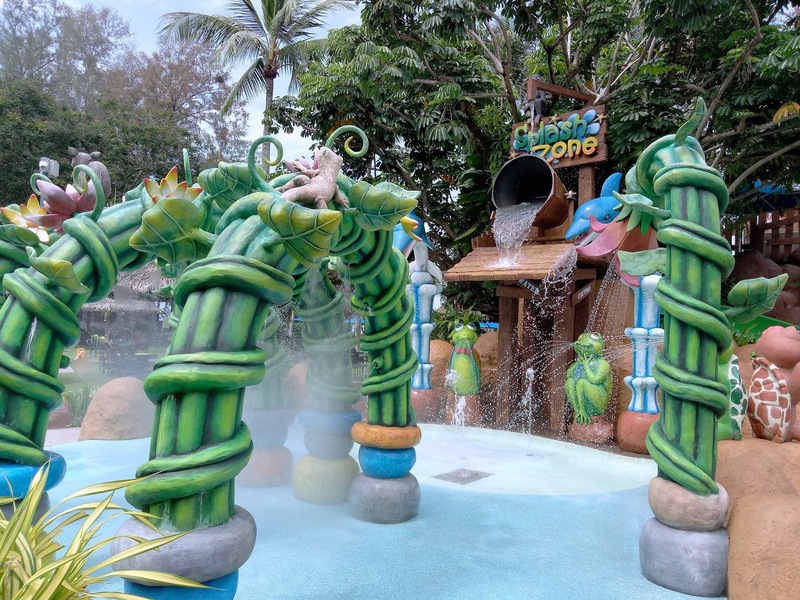 This mini water park is equipped with water jets and mists, which provide a great way to cool down during a hot afternoon. For a more exhilarating experience, wait under the large tipping water bucket which spills every 3 minutes. Also worth checking out are two water slides (one measuring 30 meters in length) and an oversized hydro massage bathtub called Whirlpool! Moving to dry land, the in-house fitness center has over a dozen pieces of exercise equipment. The gym also provides a clear view of the pools. Clean towels and drinking water are available. Outdoor recreational facilities include a 9-hole golf course, several tennis courts and a landscaped track for Ninebot/Segway. Like other Shangri-La properties, Golden Sands Resort is capable of keeping guests occupied with plenty of recreational activities. 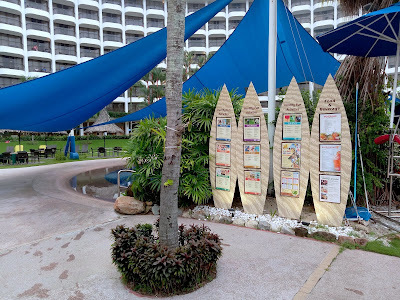 Throughout the day, there are organized events like water volleyball, beach soccer, tai chi, pétanque, golf putting, jungle walk, snake shows and cooking classes just to name a few. Some of these activities are chargeable or require advance booking. As for the more laid-back guests who prefer to bask in the sun, the poolside area has plenty of sunloungers and attap-thatched cabanas. 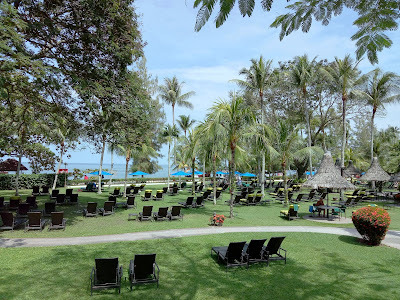 For a better view, there are more sunloungers on the green lawn facing the beach. Coconut palm trees provide random pockets of shade which shift with the rejuvenating breeze. Drinks and light snacks can be ordered from the Poolside Bar. 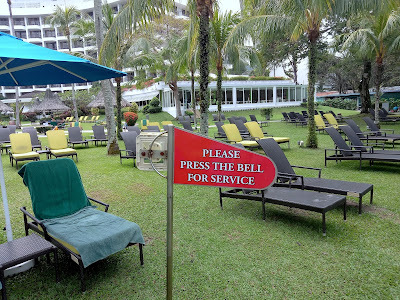 It is not necessary to walk over; guests can summon a waiter at the push of a button. Available drinks are beer, wine, cocktails and even fresh coconuts. Ice Kacang is the perfect treat on a sunny day. 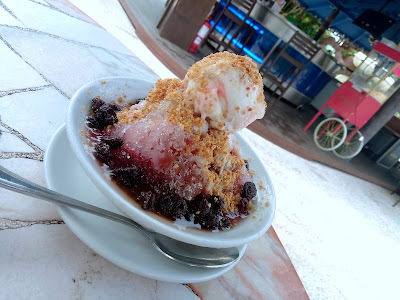 The shaved ice is sweetened with rose syrup, gula melaka (palm sugar) and evaporated milk. This slushy dessert also contains red beans, attap chee (nipa palm fruit), sweet corn, jelly, dried nutmeg, raisins and crushed peanuts. A scoop of vanilla ice cream provides the finishing touch. In collaboration with Tropical Spice Garden, the resort has set up a Spice & Herb Garden next to Sigi's. This walk-through garden showcases live specimens of tropical plants that are traditionally used in Asian cuisines. Notable examples are pepper, curry leaf, cinnamon, ginger, kaffir lime, cat's whiskers (misai kucing) and Indonesian bay leaf (daun salam). 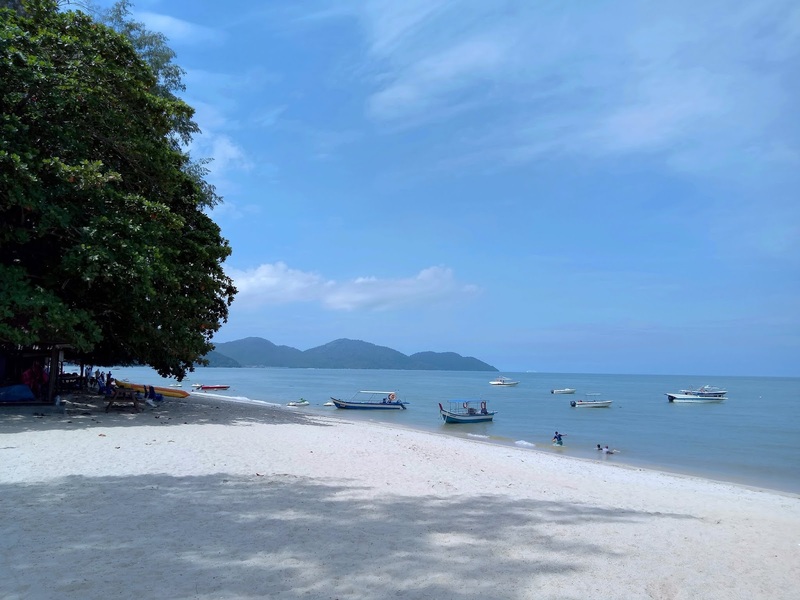 The adjacent Batu Ferringhi beach is open to the public. 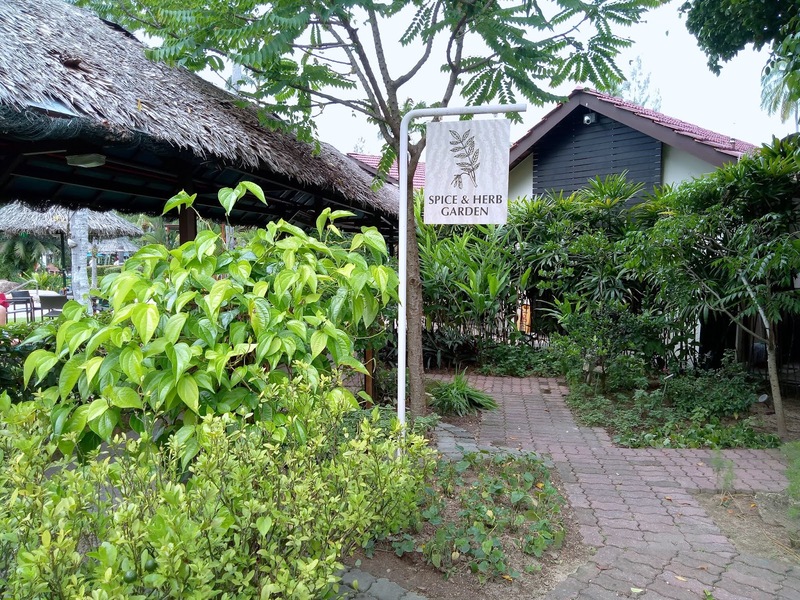 There are numerous small-time operators that offer pleasure excursions, water sports and massage services. These vendors operate independently from the resort, so guests are asked to exercise caution. 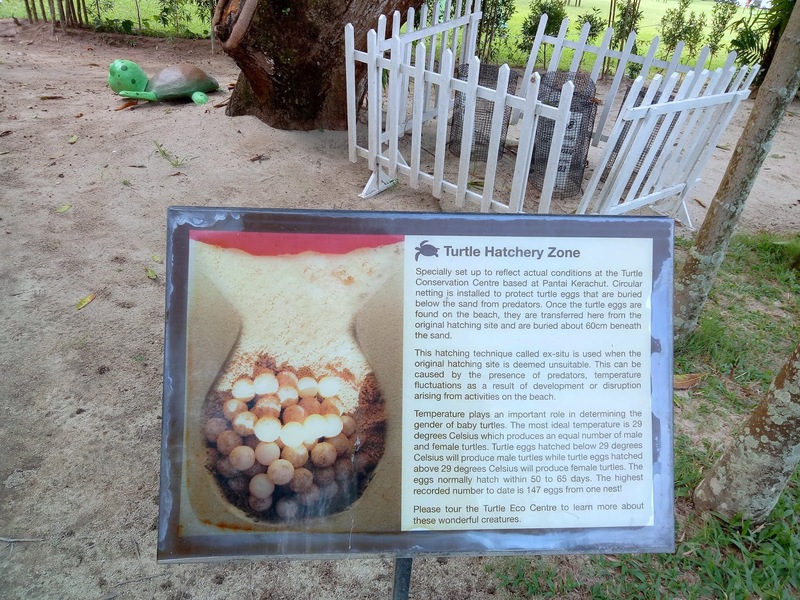 As part of Shangri-La's corporate social responsibility, Rasa Sayang and Golden Sands Resort jointly established Sanctuary, a turtle conservation project. In this project, turtle eggs that are recovered from the wild are buried here in safety until they hatch. Guests of both resorts are welcomed to visit the Turtle Eco Centre and learn more about these magnificent creatures. Sandy the Olive Ridley Sea Turtle (Lepidochelys olivacea) is the official mascot of Golden Sands Resort. 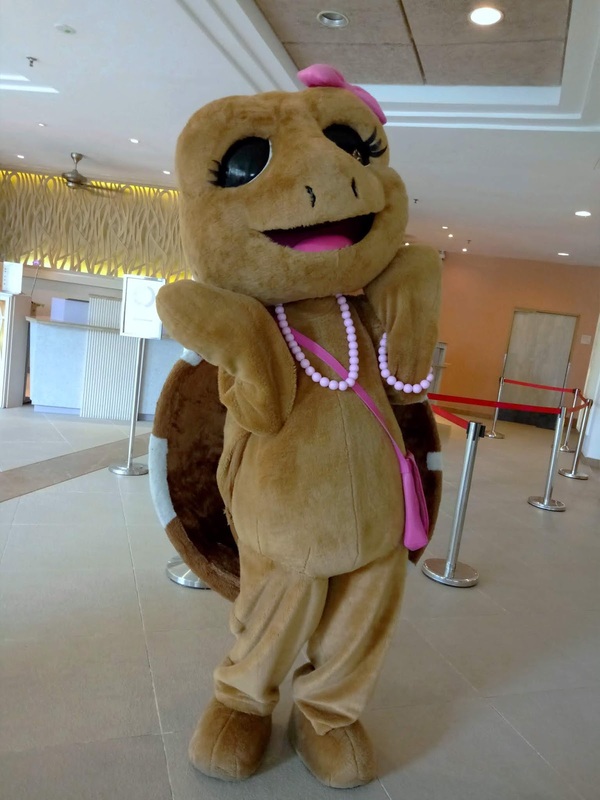 At 9:30am every morning, Sandy makes an appearance at the hotel lobby to greet guests who are having breakfast at the Garden Cafe. She is especially friendly with children! 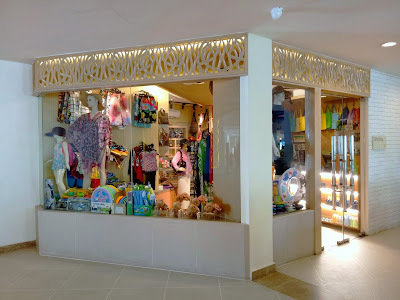 The Gift Shop at the lobby sells all sorts of merchandise such as clothing, beach supplies and souvenirs. Baby Sandy plush toys are available for sale too. 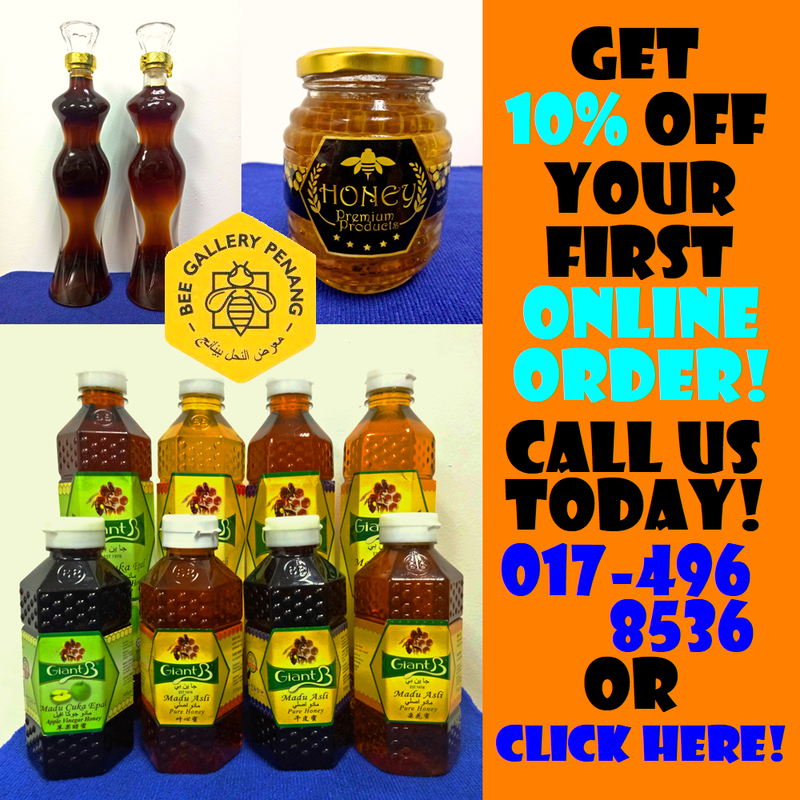 Part of the proceeds will be channeled to turtle conservation efforts. 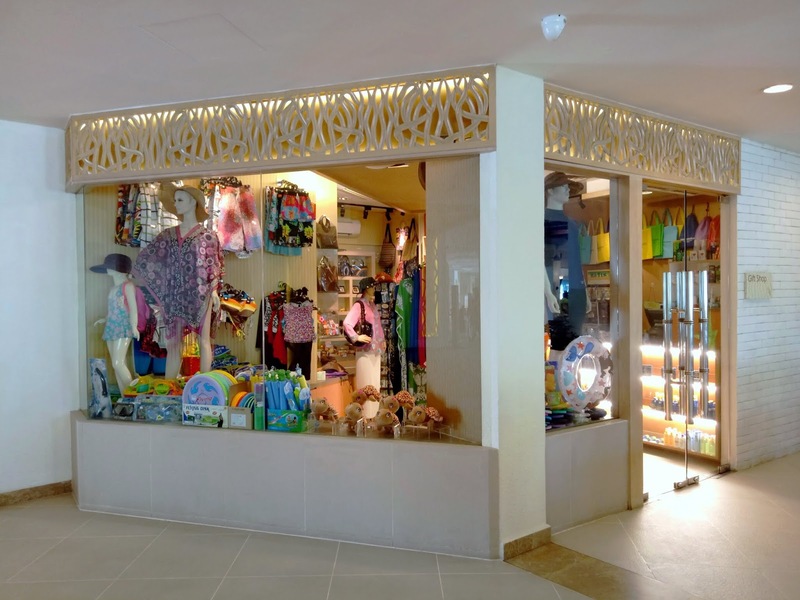 There are more shops at the Shopping Arcade, including ones that cover boutique, tailor, jeweler and beauty salon services. In effort to appeal to children, Golden Sands Resort has an in-house Adventure Zone, a large indoor playground next to the tennis courts. The family entertainment center is specially designed with exciting drop slides and children-friendly games. Furthermore, parents may leave their children under the supervision of Cool Zone Kids Club. This convenience is complimentary for in-house guests and is suitable for children between ages 5 and 12. Meals are provided. 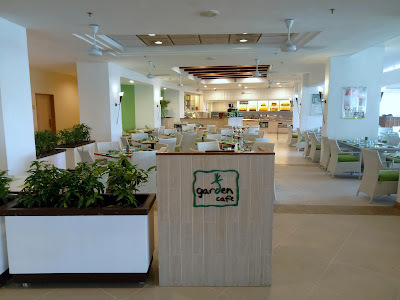 Speaking of meals, Garden Cafe is the resort's all-day dining restaurant. 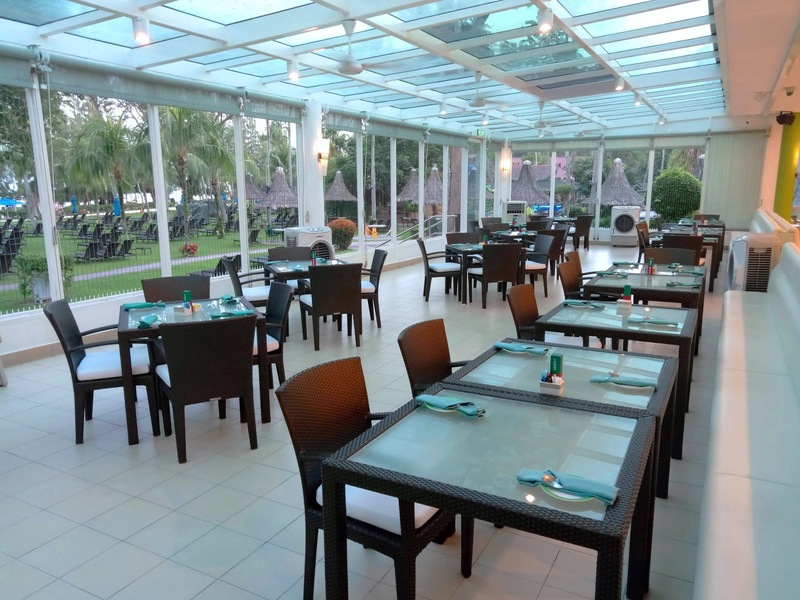 Located next to the hotel lobby, this al fresco eatery serves buffet dinner every evening except on Sundays. 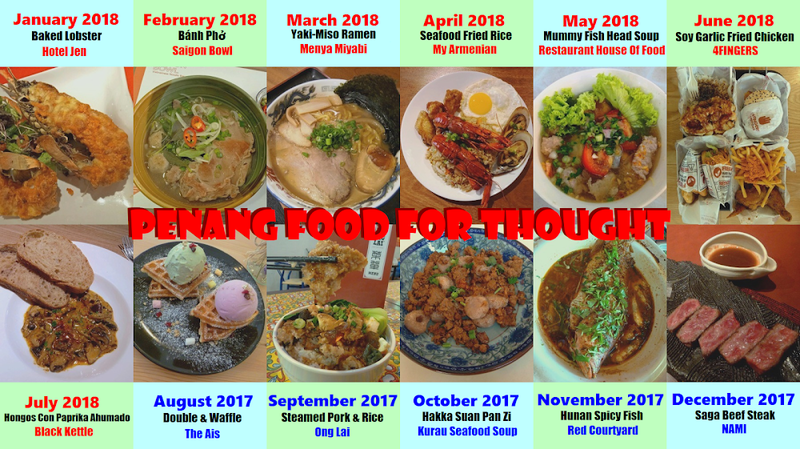 From Monday to Thursday, the "So You Can Feast" International Buffet Dinner allows two adults to dine for the price of one (RM98.00 net). Also for every paying adult, each child below 6 years old eats for free! The Garden Cafe is sufficiently large to accommodate more than 200 diners. U-shaped food counters allow guests to reach food more easily. The open-air setting also allows guests to take advantage of the refreshing breeze that flows perpetually from the sea. The Terrace is an extended dining section of Garden Cafe. Launched earlier this year, The Terrace has a ceiling that consists of glass panels, allowing sunlight to filter through during daytime. Open windows on the side present a scenic view during sunset. 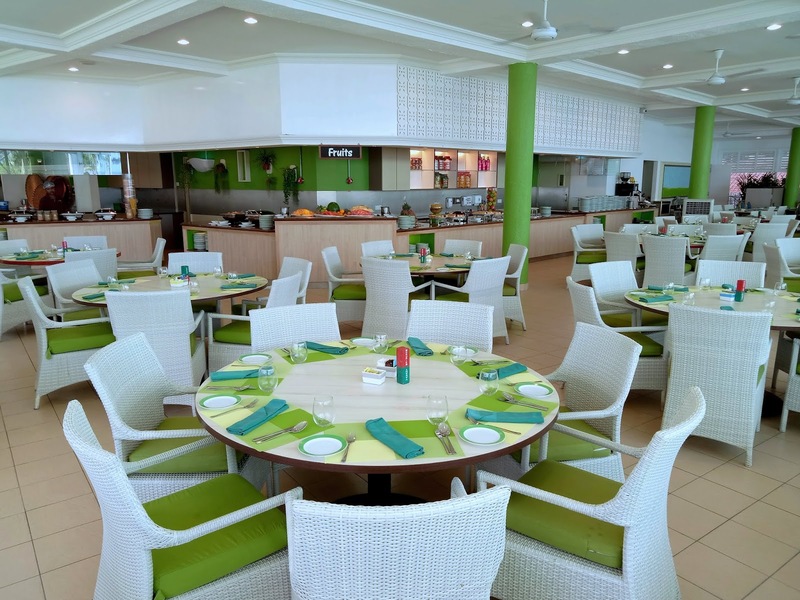 The Garden Cafe is also where breakfast is served every morning. 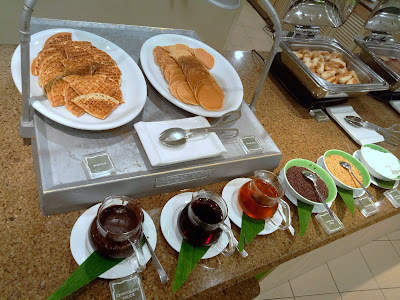 It is advisable to arrive before the main crowd (preferably before 8:30am) in order to enjoy breakfast at a leisure pace. The breakfast menu covers a wide variety of local dishes such as Nasi Lemak, Belacan Fried Rice, Dim Sum and Roti Canai. There are also several food counters that serve à la minute dishes like porridge and noodles. The egg counter is where egg dishes are prepared. 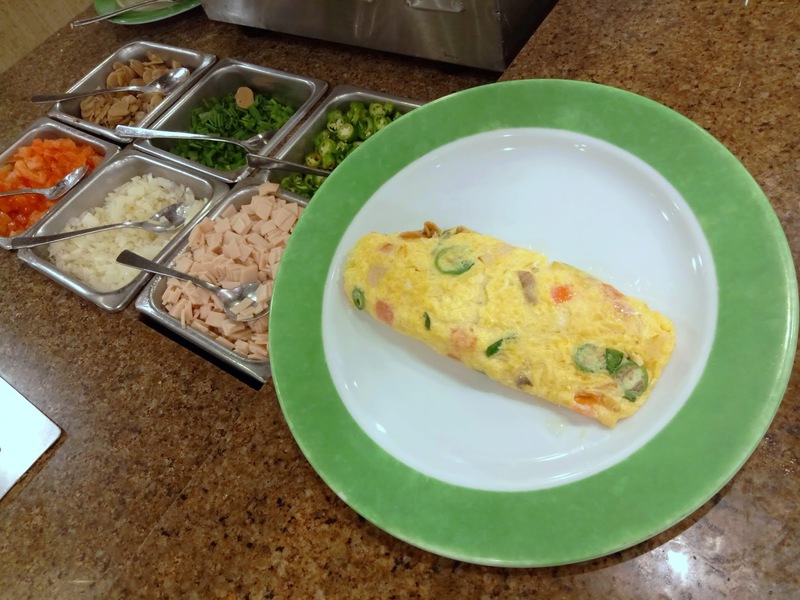 I personally enjoy a nice omelette. The omelette is filled with ham, mushrooms, tomatoes, onions, scallions and chili peppers. Also included are waffles, pancakes and French toast. They can be enjoyed with sweet condiments like maple syrup, honey, chocolate sauce and chocolate sprinkles. 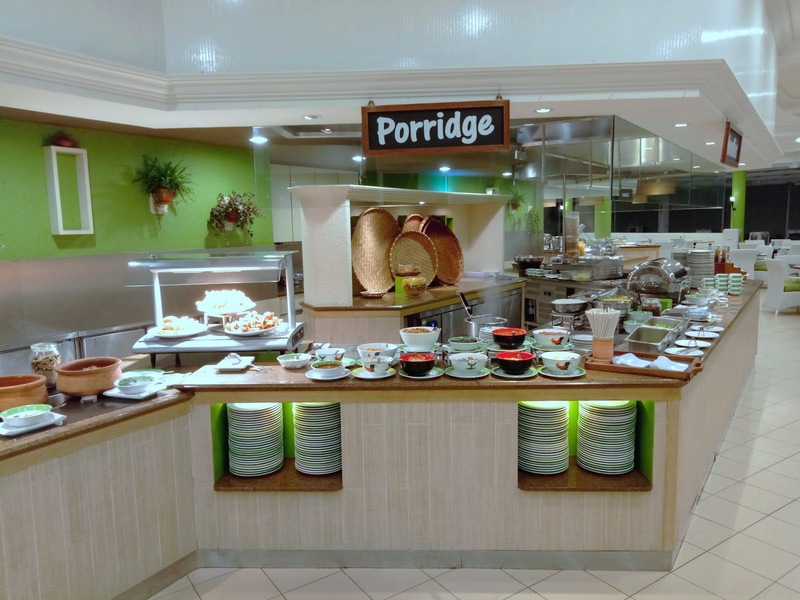 Other familiar breakfast items include streaky beef bacon, salami, chicken sausages, grilled tomatoes, baked beans, hash browns, breakfast cereals, cheese, muesli, yogurt and more. 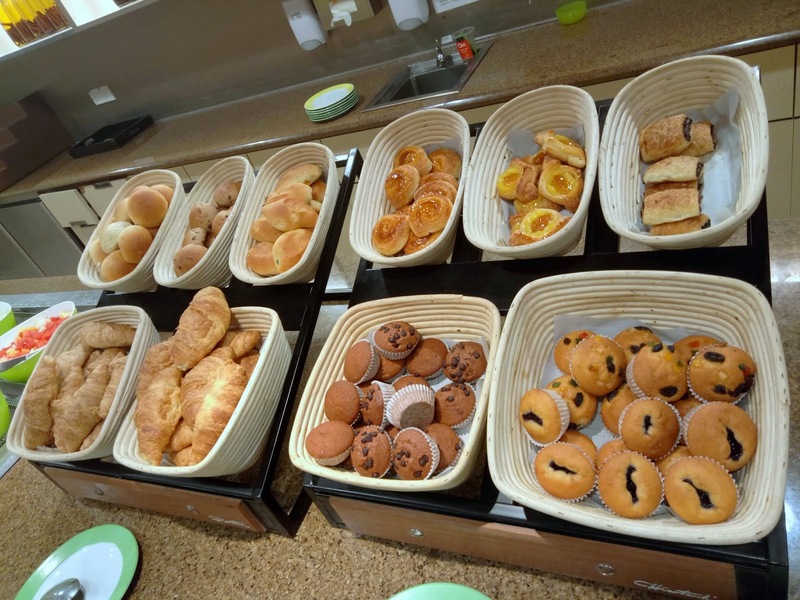 The bread basket contains a fine selection of artisan bread. Sliced white and brown bread are available too. 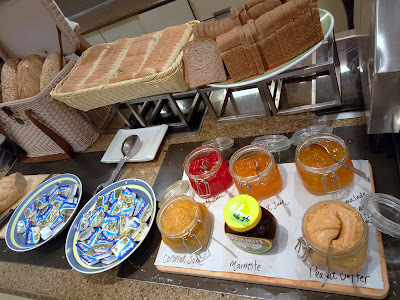 Bread spreads are butter, strawberry jam, apricot jam, orange marmalade, peanut butter, kaya (coconut jam) and Marmite (yeast extract). A conveyor toaster is provided. Other pastries include chocolate cakes, butter cakes, croissants, Danish pastries, muffins, doughnuts and bread rolls. As for drinks, there are espresso coffee, Zesta tea and a number of fruit juices. 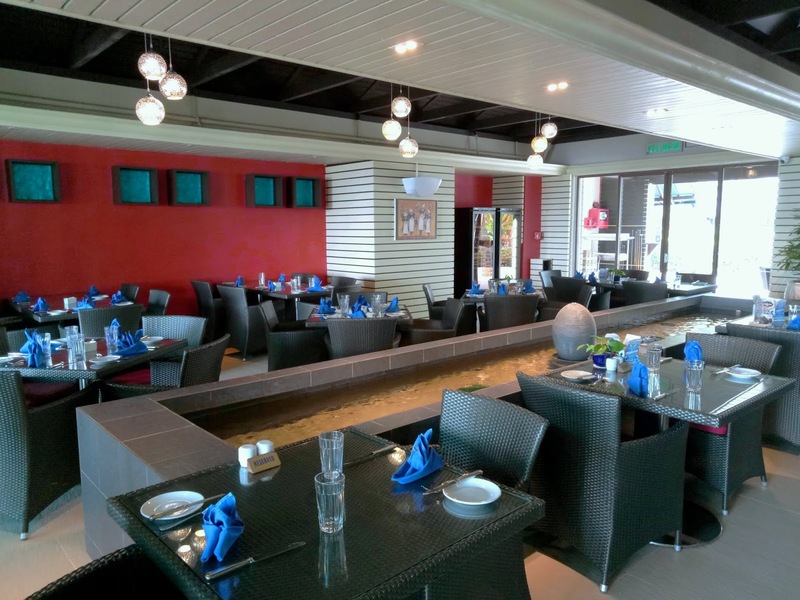 Sigi's Bar & Grill is the resort's beachside grillhouse. The kitchen is equipped with barbecue grills and a wood-fire pizza oven. A drinks bar where alcoholic beverages are concocted. The Sunday Sunset Grill is held here every Sunday evening. 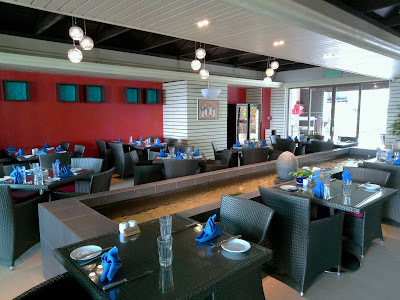 The indoor dining section of Sigi's is bisected by an elongated pond. Diners who prefer al fresco dining can also choose to be seated outdoors. Meanwhile, the Private Sundeck is the perfect venue for small private gatherings. As a beachside restaurant, Sigi's affords captivating views of the sea, especially when the golden sun sets over the evening sea. The Cool Lounge is yet another place for guests to relax and mingle. 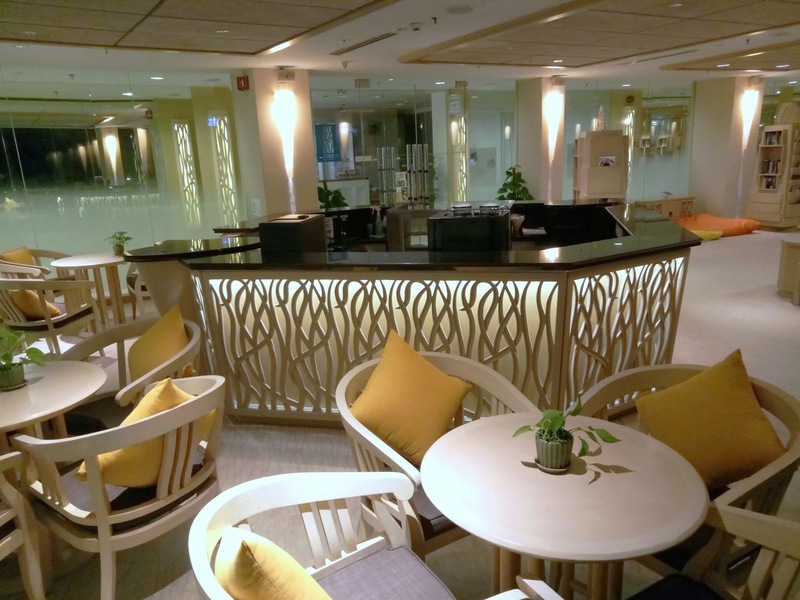 Open from 9:00am to 10:00pm, it also serves as a transit lounge for early check-in and late check-out guests. Reading materials, board games and Internet terminals are provided. Cool Lounge does not serve drinks nowadays, but guests can easily place their orders at the Lobby Lounge nearby. 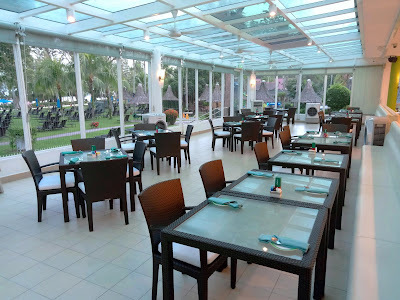 Golden Sands Resort does not have its own spa center nor fine dining restaurant. 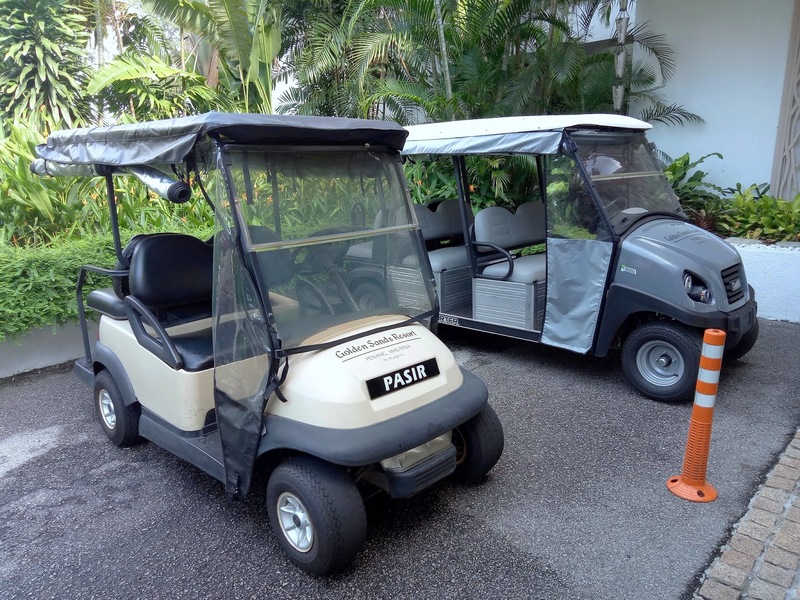 However, guests may request for a short ride on a golf cart to Rasa Sayang to enjoy these facilities. In addition, the management provides free shuttle services between Golden Sands Resort and Hotel Jen Penang in George Town. Guests from the latter property may use the pool facilities here. 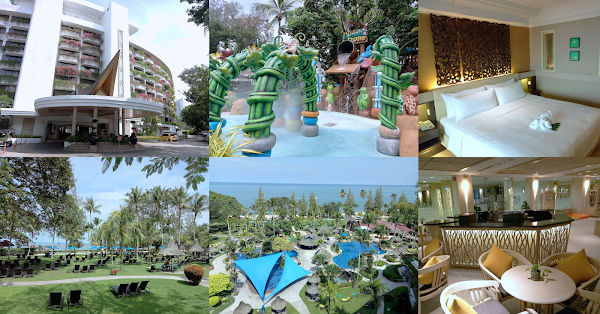 Golden Sands Resort has plenty of amenities to make a memorable family vacation a reality. 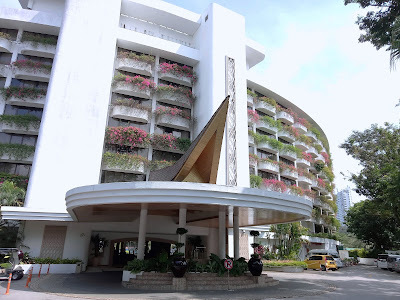 Indeed, the resort presents a class of luxury beyond a typical 4-star hotel. A stay at Golden Sands Resort is not just a "stay" per se, but is an experience of the impeccable Shangri-La hospitality. Would-be guests can book through the hotel's website to enjoy the best room rates. It is advisable to sign up for Golden Circle membership for free. Golden Circle members are rewarded with loyalty points whenever they spend in any Shangri-La property. 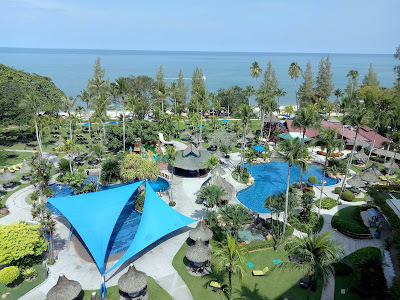 Directions: Driving from George Town and upon arriving Batu Ferringhi, Golden Sands Resort is located on the right at the first traffic junction. Parking is complimentary for in-house and dine-in guests.